H-3 visa in the United States refers to non-immigrant visas intended for foreigners who come to the US to participate in an internship program for an existing profession or specialty in order to improve their qualifications since such an internship is not possible in the country residence of the foreigner. H3 in the US is not a work visa and the purpose of the visa is to learn, not to start a new profession or specialty or to get a degree. H3 is not available for medical training. In this article, we will look at what the requirements of US legislation for the above-mentioned foreign interns, areas for which the H3 is available in the US, the validity period of a visa, and other issues related to obtaining an H3 visa for students. The applicant must have a residence in another country that he or she does not intend to refuse. Applicant must not participate in the US H3 Visa Program for employment in the US. 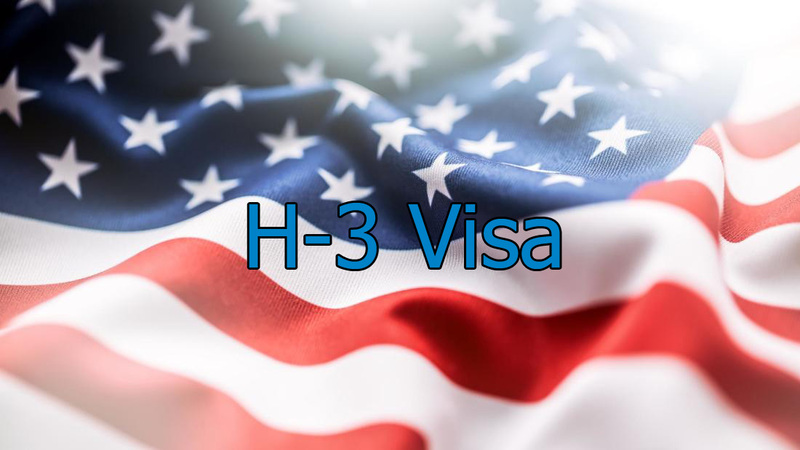 In addition, the regulation provides that spouses and minor children of foreigners who are issued H3 visas for trainees can accompany participants of the H3 US Visa Program, if they have received H4 type visas for entry into the USA. As already mentioned, the H3 requires the applicant to obtain a visa with the availability of a residence in another country without any intention to refuse it. Thus, the double citizenship intention is not allowed. An H3 type work visa is granted to foreign interns who wish to complete vocational training in the US in any field of activity other than medicine with the aim of improving their skills in that field. As already mentioned, we are talking about raising the qualifications that already exist, and not about gaining knowledge in some other field. In addition, temporary non-immigrant H3 for trainees can be granted only to those foreigners whose qualifications meet the requirements for study participants. explain what benefits they have from the professional training of foreign trainees. The organizers of training for holders of H3 in the United States provide different evidence of their benefits, for example, that an international company conducts an internship at a training center that is located in the US or training is conducted for employees of foreign offices of American and other companies, or an employer of foreign interns in the country of residence is related business with a company in the USA. US law allows the only possibility when a foreign trainee is allowed to work while in the US under the received H3 visa status. Such work is possible if it is not a significant part of the internship program: a foreign intern can work no more than 50 percent of the time that is allotted for the entire vocational training program in the US. an indication of the reasons why such training cannot be carried out in the country of a foreign trainee and why such training is necessary for him in the United States. the applicant does not have competent specialists for training according to the declared program. An application for an H3 is submitted by completing the I-129 form — Applications for a non-immigrant worker (with supplement form H). One application may contain information about several interns, if the interns will do the same practice in the same place and in the same period. Spouses and unmarried trainee children in “H3 visa” status are eligible for an H4 visa (if applicable) to accompany or to join an intern in “H3 visa” status for the same period as the H3 for trainees. Rejection of an application for an H3 in the United States may be appealed to the Administrative Appeals Board (AAO). Some persons legally admitted as non-immigrants in the US have the right to change the status of H3, provided that they have an I-94 form with an expiration date. However, this will depend on the status in which the non-immigrant legally resides. Work visa type H3, as already mentioned, is not intended for employment in the US. Therefore, US employers who are looking for foreign workers for employment in the United States should consult with a lawyer regarding non-immigrant and immigrant visas that are designed specifically for the purpose of employment. An experienced attorney will be able to assess the applicant’s tasks and the ability of the alien to obtain H3 status or another visa status in order to advise the visa concerned. One interesting note that applies to H3 visa holders in the US. Some foreigners who are eligible for an H3 may also be eligible for a visa of type B1 or status J1. This note is another argument for obtaining a professional analysis of a lawyer regarding the tasks of the applicant and the foreigner in the realization of their mutual desire, swinging or getting an H3 for trainees, or for obtaining another visa that would enable the foreigner to find a job in the USA. contact Houston Immigration Law Firm today!